A mother-of-16 has figured out a chore rota which brings ‘order to the chaos’ and will set alight the hearts and minds of anyone who loves organisation and a nice laminated print-out. Jeni Bonnell is a superwoman and vlogger mum who came up with an easy-to-use job roster which means all 16 of her children will help out with the mammoth task, usually left to their mother, of keeping the house clean and tidy. 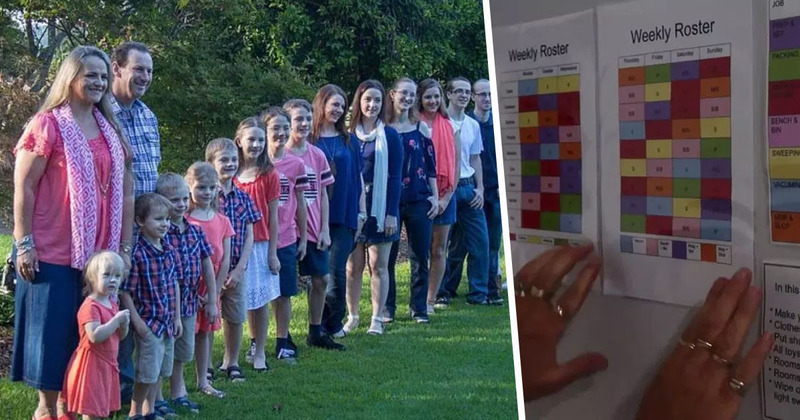 Jeni lives in Queensland, Australia, with her husband, Ray, and their 16 children – Jesse, Brooke, Claire, Natalie, Karl, Samuel, Cameron, Sabrina, Tim, Brandon, Eve, Nate, Rachel, Eric, Damian, and Katelyn. They’re aged between four and 28 and as soon as Jeni’s kids turn eight years, she puts them to work helping out around the house. Amazingly, it has become such a key part of family life for the Bonnells, the kids want a piece of the action because the system helps them feel part of the family mechanism. Jeni said the younger ones got ‘upset’ if they weren’t on the roster; a fact she says is both ‘cute’ and ‘encouraging’. We have to keep some sort of order to the chaos that is our big family. Our job roster came about back when we had six or seven children. I was a stay-at-home mum and dad was working hard. Even though the children were small I felt as though I wasn’t teaching them how to learn these skills and how to give back to the family. If mums are doing all the jobs all the time, no one is having any fun. If you live here you work here…. after all when they move out into their own homes all the jobs are theirs. Good grief Charlie Brown!!! Look what I have waiting for me ….baskets of I-R-O-N-I-N-Gone of my least favourite jobs.BAHAHA!! She said when she started the roster it was just ‘scribbles on a bit of paper’ and was ‘very time consuming’ to organise, especially when her children started getting part-time jobs and extra-curricular commitments like sports. The roster hangs on the wall. It’s so everyone can see what job they are on that night and learn different skills. Now, it is a lot more organised and the family sit down weekly with their timetables. They have laminated cards with jobs on and varying jobs are put next to their names. The rota is made up of seven chore-types including, Prep and Set, Packing, Washing Up/Drying, Bench and Bin, Sweeping, vacuuming, and something Jeni calls Mop and Slop. Now, Jeni says, she can be a mum who isn’t totally ‘exhausted’ by all the physical and emotional labour – and she wants the same for other other women experiencing motherhood out there, too.